It would seem that Israel’s outgoing Prime Minister Olmert did not take kindly to the annual report of the Jewish People Policy Planning Institute. An “ongoing corruption problem” emerging from the “ruins of the Olmert government”, as well as the “failure” of the 2nd Lebanon War, were cited as impacting on the Diaspora’s view of Israel. As head of a government that has done much to directly enhance the relationship between Israel and the Diaspora, Olmert must have been particularly irked to be so besmirched. 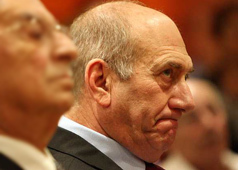 But at root Olmert’s outburst points to a deeper issue. What is the business of Diaspora Jewry? Into what are Jews around the world allowed to stick their noses? It is very much in vogue to bemoan the lack of nuance in the Diaspora’s relationship to Israel. This site itself exists to give voice to more complexity in this relationship. An element of this complexity would seem to include proclamations of the virtues of ‘dialogue’ while holding on to the deep-founded Israeli conviction that Jews around the world should keep their mouths shut and their wallets open.